The deadline for Illinois residents to review and respond to the state’s plan to keep nutrients from farm fields, city streets, and wastewater treatment plants out of our waterways is just around the corner. All comments must be emailed to simon.daniels@illinois.gov or mailed to NLRS Comments, Illinois Environmental Protection Agency, Bureau of Water, 1021 North Grand Ave. East, P.O. Box 19276, Springfield, IL 62794 by Jan. 24. 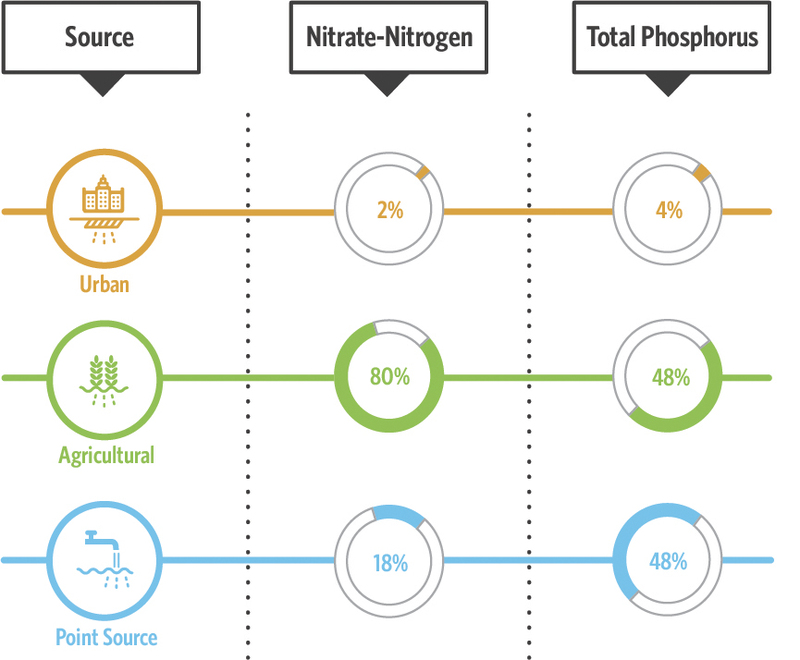 The Illinois Nutrient Loss Reduction Strategy outlines a suite of voluntary and mandatory practices for reducing phosphorus and nitrogen losses—the primary drivers of algal blooms that lower oxygen levels—from both urban and agricultural sources. By targeting the most critical watersheds and building on existing state and industry programs, these practices are expected to ultimately reduce the amount of nutrients reaching Illinois waterways by 45 percent. This and other stories from the Winter 2015 Helm are also available at our Newsroom or on Issuu. ***Image: Breakdown of nutrient loads leaving the state in rivers.